Discussion in 'Pin Trading' started by Spr175psu, Jun 21, 2018. 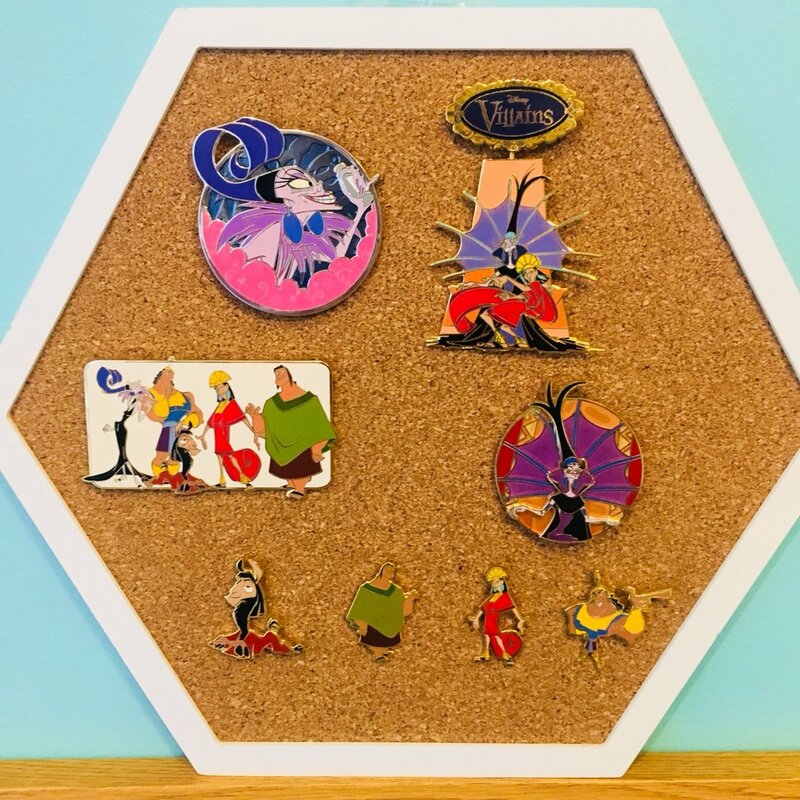 Hi All, so I was looking at my Emperor's New Groove collection on pin pics and realized that if you don't count buttons, which most don't but I like them, I am only 9 pins away from being an ENG completist! It's absolutely true! Anyway, please check my pin pics (same as here) for the final 9. Three are listed in my grails signature. Please PM if you have any of these and hopefully we can work something out. Any help would be greatly appreciated. And with your help, I can be an ENG completist! As a fellow ENG collector, I wish you luck! I'd love to see a complete ENG collection, or one that's almost there. Have you posted pics of your collection anywhere on the forum? That cast jumbo has been a toughie, but I'm super jealous that you have the kronk canoe races pin. I've never even seen that pin anywhere! Mr. Toad is my primary collection so I made a board for that one first and I have definitely been slacking with my other collections. ENG is probably next on my list, if I don't do Hercules or Gaston first. Good luck also tracking down those pesky HTF pins! Oh whoops, I'm actually missing 10 pins. I totally forgot about the cluster!! I need that too! I'm on the same boat as you two! Except I am no where near being a completist. Someone just posted some ENG pins for sale in Facebook group Pin Junkies. I don’t have any of your ENG ISOs but thought i’d Try to help where I can. I don't have any in my traders that aren't super uncommon but I'm happy to run a pickup for the lunchbox if you don't have it already! Thanks! My main collection is Up but Kronk has always been second. The Canoe Races pin I got a long while back and it wasn't even listed on PinPics. The PinPics photo is my pin. I've never seen another one. I don't know much about it or even how many there are out there. I hope there's more floating around because it's a great pin. I'm rooting for you. When you get your board done I would LOVE to see it! If you still need it, please let me know and good luck with your quest! Thanks for the heads up! Unfortunately I was too slow to get the one I needed. Thanks for the offer but I think our resident wizard was able to grab one for me. I've seen other canoe race pins in the past but never that one. The search continues! I do still need that one but I don't think I have any of your Wants or anything that would work. Thanks though, and I'll keep my eye out to find something suitable for it. Thanks! I was at Disney Springs yesterday and saw that the Kronk Speaking Squirrel pin was still there! Not sure if you're coming to WDW anytime soon but if you're not, then let me know, I can probably help you out. Here’s my collection so far! DeputyDonald and Spr175psu like this. Hey Sarah did you get those cork boards from Target? If so I have the some ones. My wife has been buying them up anytime she sees them. They’re definitely the best deal for the price. Thanks for sharing your collection. Those are awesome! Still don't got it. One day. The cast jumbo and pretty much all those are Grails of mine! Congrats! Don't congratulate me yet, I'm still chasing it. Good luck to all of us! Resurrecting this thread since I am 6 away from completist status (and 1 away from Kronk completist status. Darn that Cast Jumbo!) once a certain Kronkular Canoe pin arrives today!! HOORAY!!! I'm so happy you found a canoe races pin! Congratulations! Fingers crossed that 2 cast jumbo pins magically appear soon - one for you and one for me! Three please! I don't imagine ever being a completist but that cast jumbo is an absolute. I am happy to have scored the Squeak Squeaky squeakin squeaker pin today though! caw caw rawr and Spr175psu like this. My friend on Instagram is selling the Cast Jumbo, currently he is taking best offer. Quick update: DLRP Yzma Y has been found! Yzma Disney Auctions pin found! Only 4 to go! And of course they are the hardest four there is. I've only seen the two Kuzco pins in the wild before and balked at the asking price, which I now regret. Alice’s House of Treasures is selling the Disney Auctions Villains LE100 for $950.